Being fully Apple Authorised, HardSoft are able to centrally register the Macs and iPads we lease to customers with Apple, which helps them with the management of their assets. Apple have recently relaunched their Device Enrolment Programme (DEP) as the new Apple Business Manager. This is, in essence, the enterprise version of Apple School Manager, which gives companies a web-based portal for IT managers to deploy and manage Apple devices across the workplace. 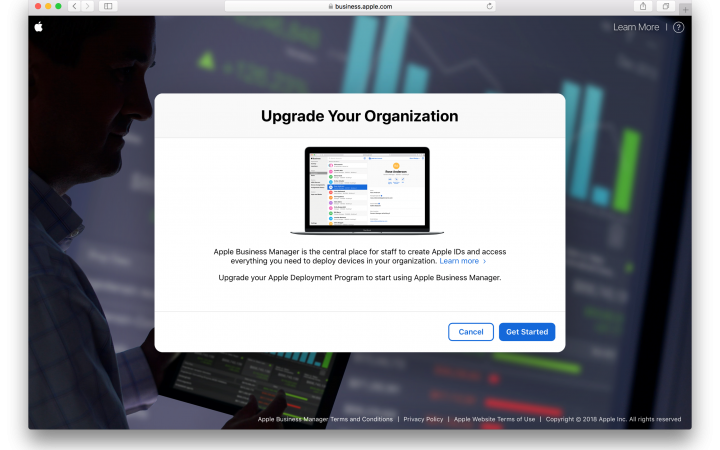 Apple Business Manager lets you buy content and configure automatic device enrollment in your Mobile Device Management (MDM) solution. Apple says that this service offers businesses sleek device enrolment, controls for assigning privileges and settings, as well as the ability to purchase apps and books, all from one central location. Signing up for Apple Business Manager as part of your lease means that you can deploy Macs, iPads and other iOS devices which you have leased across a business or school. You can then supervise from a distance any iOS devices owned by your business but used by your staff, whether they’re office based or work remotely. This level of management allows you to add restrictions, such as turning off integral games and apps, as well as blocking certain apps from being downloaded to the device. With Business Manager large-scale deployments of iPad and Mac are seamless. Your devices are configured through a Mobile Device Management (MDM) solution, we use the Airwatch MDM software solution – which costs £1.00 per week extra on a three-year lease, users are then guided through the activation process. Through the Device Enrollment Program, businesses can choose to supervise corporate-owned iOS devices over the air and the supervision of this provides a higher level of device management customising configurations and features specific to your school or business. What can I do with Apple Business Manager? In addition, you can add a Mobile Device Management (MDM) profile for each device. The MDM allows the centralised control and deployment of software. Using an MDM gives you the ability to configure access to corporate services, account setting, and even which apps can be used. This removes the need to deploy your devices manually and means that your staff can get working as soon as the device is turned on. There is no need to have someone from your IT team physically set up each device individually. This is only offered by Apple Authorised Sellers or direct from the Apple Store. HardSoft has provided rollouts to such organisations as the Marie Curie cancer charity, as well as Dee Valley Water. You can lease the iPad Pro 10.5-inch with Mobile Device Managment bundle from HardSoft, on a three-year lease from £7.50 per week + VAT. The Benefits of Apple Business Manager and an MDM solution are massive but if you want to know more take a look at the FAQs below, or give our sales team a call on 020 7111 1643 and they will be happy to talk you through why Business Manager and MDM make sense for your business or school. Does HardSoft manage the whole process? Not entirely. HardSoft role in the device enrolment process consists of order management functions, such as providing device serial numbers or IMEI numbers, creating a customer’s Customer ID, providing our Reseller ID, and a few other order details. Further actions in the programme — such as claiming and assigning devices in the website and or to MDM servers — are the responsibility of the customer. What resellers, distributors or carriers are eligible to support Device enrolment for their customers? Any Apple Authorised Reseller such as HardSoft, or Telecoms carrier, such as O2, EE is eligible to participate in the programme. Can adding devices into the Business Manager resolve issues with the new law General Data Protection Regulation (GDPR)? No, though it is the first stage in adding a Mobile Device Management Solution such as Airwatch that would conform. The new GDPR law states you must implement “appropriate technical and organisational measures to ensure a level of security appropriate to the risk, including…encryption of personal data” (Article 32, Security of processing). In the event of a data breach, the organisation is not required to inform individuals of the breach if measures that “render the personal data unintelligible” were in place, including encryption (Article 34, Communication of a personal data breach to the data subject). GDPR is a concern to all Companies with the potential for heavy fines. Mobile devices such as iPads ‘roaming;’ the country with Data on are a hole in an IT security set up that needs addressing. What does the customer need to provide to Apple to enrol devices? We require the customer’s Customer ID (Apple will provide this to the customer after on line registration), the HardSoft ID, the device IDs of the devices sold (serial numbers or IMEI numbers), and a few details about the order, such as delivery date. Does HardSoft specify in the terms of sale that the device must be removed from Business Manager when the customer no longer owns, it? No but the Apple Business Manager terms agreed to by the customer at sign up require a customer to remove devices that they no longer own. Be aware that any devices lost, stolen will need removing. Is there a charge to participate in Apple Business Manager? Apple does not charge customers to participate in the service or Apple School Manager scheme. An MDM solution such as Airwatch would be at extra cost. Can HardSoft help by enrolling devices into Business Manager? Unfortunately no. End users must enrol in the service or Apple School Manager and accept the terms and conditions themselves. Customers who request HardSoft to perform additional integration or management services (such as an MDM) can latterly create an admin account within their portal or Apple School Manager portal to add and manage these services on the customers behalf. Could customers create their own API? Organisations should be able to develop functional integration with Apple’s device enrolment APIs using two or three developers in about 10 weeks. Alternatively, an off the shelf solution should be considered. HardSoft offer VMWare Airwatch.